My girlfriend and I spent Friday evening at the chefs counter at Le Pigeon, in Portland, OR. Le Pigeon is certainly one of the most exciting places to eat in Portland. Chef Gabriel Rucker won the 2011 James Beard Rising Star Chef of the Year award and Andrew Fortgang, the GM and Sommelier, has a wine program that is top notch. 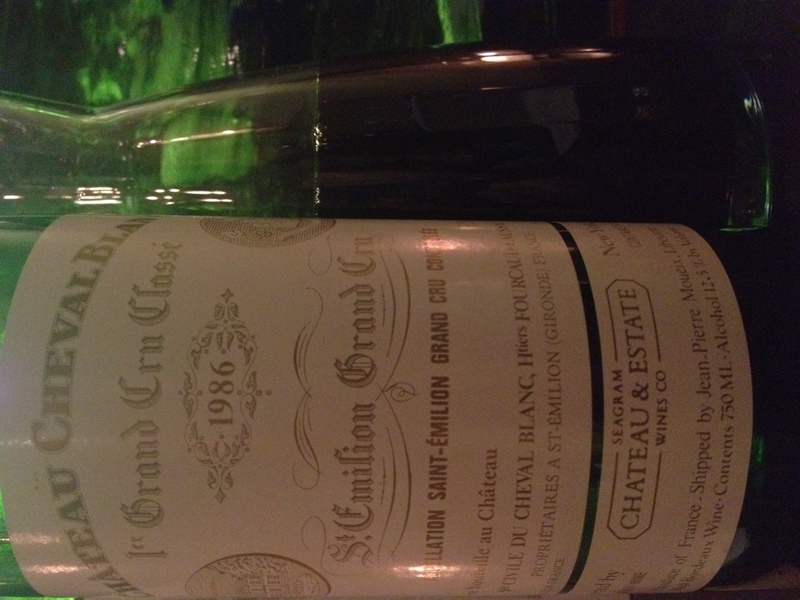 I brought a bottle that had been burning a hole in my storage locker: 1986 Cheval Blanc. The dishes were beautiful. The foie was rich and decadent balanced by the light crunch of ramen cake and the miso-tart broth flavors. The porcini and parsnip soup was spectacular and earthy, but the barbecued eel toast stole the show for me. Both dishes were highlighted and heightened by the non-vintage Rueda. The Dorado is traditional, oxidized, sherry-like, produced from Verdejo and Viura fermented underneath a layer of flor and then aged in a solera system. Quite dark and nutty, almost like amontillado, it is still delicate on the palate as it is not fortified. Smells sweet and full of glycerol at 15%, but is quite dry, fresh and balanced with bright acidity and aromas and flavors of plasticine, sweet almond, brine and dried flowers. Beautiful marriage of cuisine and wine. The entrees were delicious, especially the New York. I love how well seasoned the food at Le Pigeon is. What I found most spectacular about the entrees was a small component, but more importantly, a first for me: white wine vinegar and horseradish pickled baby deer heart that garnished the meatballs. Almost like pastrami, it was thinly sliced, tangy, earthen. Just lovely. Cheval Blanc needs no introduction. A wine of storied history and unarguable superlative quality, it is somewhat of an outlier of the right bank of Bordeaux due to the high ratio of Cabernet Franc. Quite ‘wet’ bouquet of earthen pine plank, leather, black tea, dry cassis, peppercorn with hints of dusty bramble, nutmeg, sandalwood and a clear mint, camphor and menthol note. There was discussion of brett as the wine was a bit compact and tinny at first, but in the end it seemed as though the wine was clean, fully mature and expressive. On the palate, the wine was on the lean side, soft and gentle with high toned cedar box, sandalwood, dusted dry black cherry, menthol, espresso. 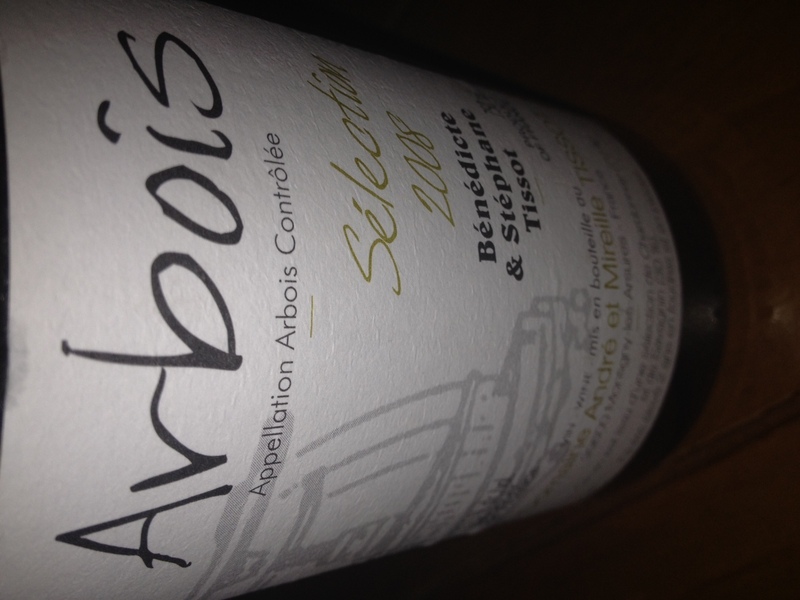 The was a nice brush of acidity with nice midpalate depth and a black tea and leathery finish. There is a flurry of character with each fresh pour, medicinal and camphor freshness inter fingered with quite grippy and bitter espresso tannins. Lovely bottle that has reached full maturity and should be consumed now. To finish, we had to order the Foie Gras Profiteroles with caramel sauce, sea salt and enjoyed a glass of 2005 Castelnau de Suduiraut, which was lovely. I love Sauternes, maybe as much as I love Foie ice cream…We also enjoyed the German Chocolate Bread Pudding with dulce de leche, coconut ice cream and a glass of Boston Bual. This outshone the profiteroles, though the Boston Bual did not have the strength or sweetness I desired. No matter, the experience was not lessened. 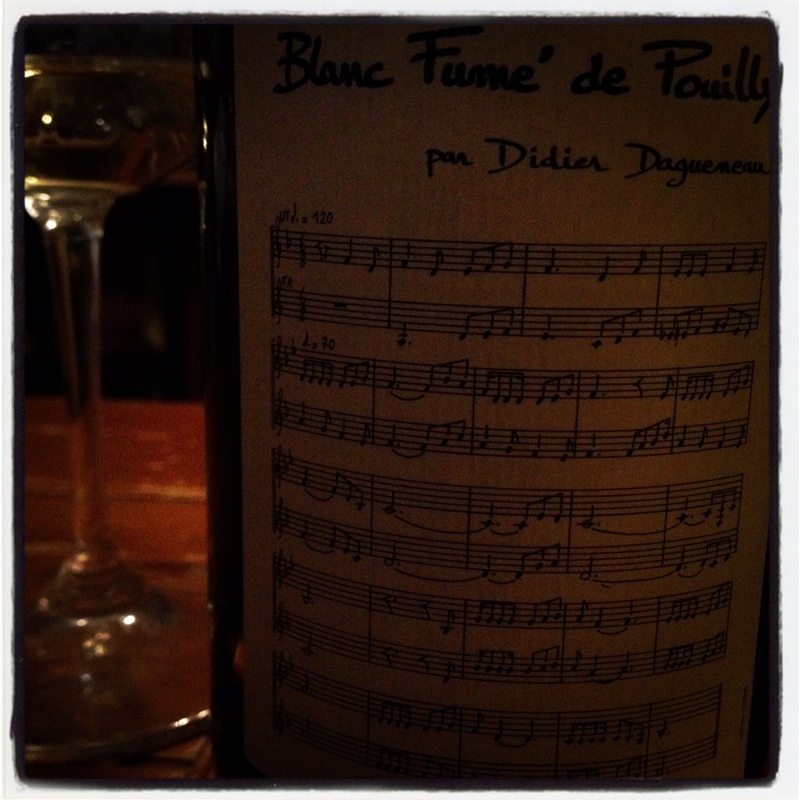 Moral of the story: go eat at Le Pigeon if you want an truly wonderful epicurean adventure. Don’t fret about bringing your own wine, the list is a veritable garden of vinous delights with a great selection of REAL wines and one of the best half bottle lists anywhere in PDX. Beyond the slew of great values from little known regions from around the Old World, the list is studded with young and fully mature jewels from the likes of Chandon de Briailles, Raveneau, Bourdy, Pichler, Chevillon, Groffier, Roulot, Occhipinti and more. And when you go, style yourself out. 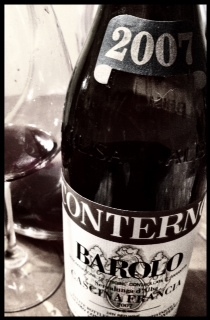 A glimpse into 2007 Conterno. 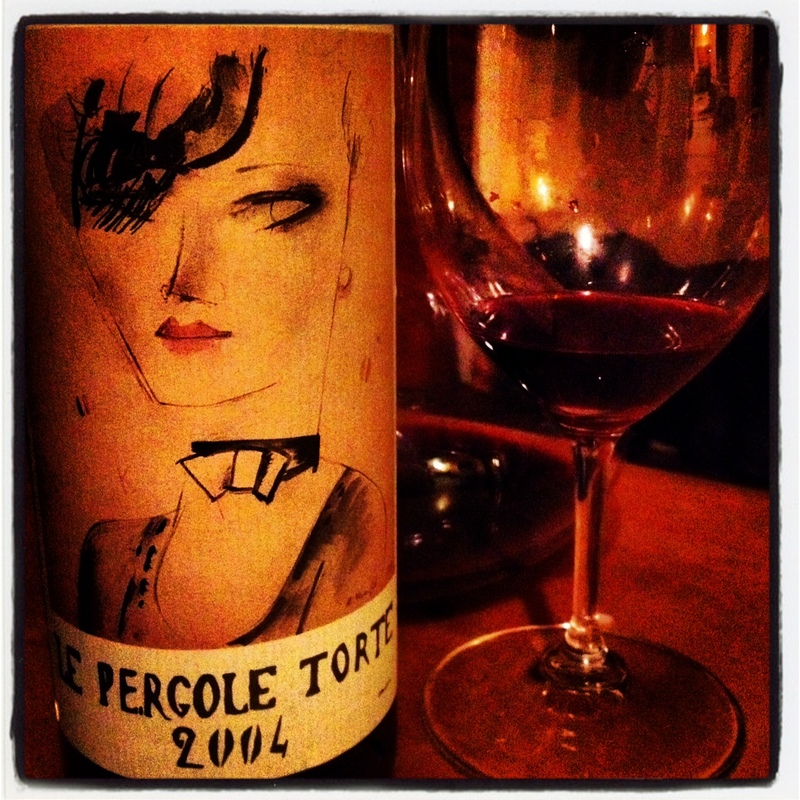 The palate is conceived by and strung around the oh-so-fine tannin. The structure something fierce. Rich though restrained, the epitome of rustic elegance, delicate structure and humble pedigree. The acid is etched into the background and pervades throughout, highlighting the balance of power and spine. Creamy anise seed, baked earth, amarena cherry, dried raspberry, mocha, sawdust, brine, before a grapefruit pith and walnut skin finish. Earthen, deep, bitter and focused. If this is going to be drunk now, goddamn, is it good. We probably should’ve waited, but who knows when I could die. It could carefully watched over the next twenty or thirty years, though it might prove itself over the next forty or fifty years. This is cerebral wine. This is REAL wine. This is a wine that should not be missed.